Do you have ancestry in the Alberton or Gold Coast area? 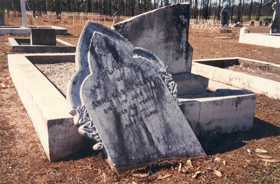 Alberton Cemetery is located in Zipfs Road, Alberton, in the Gold Coast City area of Queensland. This transcript was made in December 1995, with the earliest inscription being the death in 1882 of August Hermann Mohr. If you have family members you think may have resided or been cremated in the Alberton region, this is a wonderful genealogy tool for anyone building a family tree or exploring their family history.